The Sole Administrator of the Rivers State Waste Management Agency (RIWAMA), Bro. Felix Obuah, has again emphasised that engaging service providers to clean Port Harcourt City and its environs would not be subjected to political consideration but purely for those who have the technical know-how and capacity to do the job. Bro. Obuah, who stated these while addressing service providers at RIWAMA’s office last Wednesday, said it was necessary to sound it clear so that they would take their job seriously. While thanking the contractors for a job well done during and after the last Christmas period, the Sole Administrator, however, observed that a lot of cleaning still needed to be done in some sections of the city, warning service providers in charge of those areas to clean up the garbage or have their contracts terminated. The RIWAMA boss also warned that the law would soon catch up with all those who had continued to dump refuse at the median, adding that a special task force has been constituted to arrest and prosecute this group of individuals. 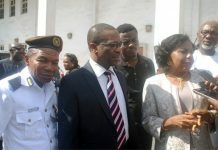 He declared that the Agency was determined to put a stop to the wrong habit of defacing the roads with refuse, particularly now that attention is drawn to the 50th Anniversary of Rivers State with the attendant influx of visitors to Port Harcourt. ”We just have to keep Port Harcourt and its environs neat. A situation where, after service providers will finish carting away the garbage, some persons will come and litter the median with refuse, is utterly unacceptable”, he said and solicited the assistance of the service providers in this regard by carrying out an internal check mechanism to curb the menace. The Sole Administrator who attended the meeting along with his Special Advisers, including the DPO in-charge of the RIWAMA Police Station, said the meeting was not intended to terminate the services of erring service providers but to urge them to double their effort to keep the City and its environs clean and healthy. Some of the service providers who spoke at the meeting promised to keep up their commitment, and thanked the Sole Administrator for carrying all service providers along irrespective of political affiliation.